This article asks: “Is this the Doctor Who general election? And are Labour hoping that some of the popularity of the show will rub off on them?” The forthcoming UK general election and Doctor Who do seem to be becoming evermore interlinked. 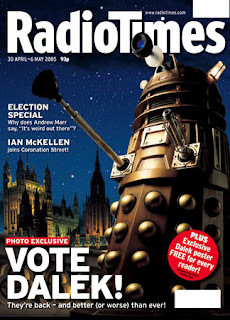 The new issue of Radio Times, harking back to its 30 April to 6 May issue from 2005 (opposite), shows the Daleks in the colours (blue, red and yellow) of the three main UK political parties, David Tennant, earlier this year, declared his support for the UK’s Labour Party and Prime Minister Gordon Brown, the party’s current leader. Earlier this week, the Labour Party turned to the Doctor and a son of the Doctor in it’s campaign to win re-election in the contest. The first party-election broadcast of the campaign premièred on YouTube before airing on UK television channels. In the Labour Party broadcast, The Road Ahead, the third Doctor Jon Pertwee’s son, Sean Pertwee, appeared, while the tenth Doctor David Tennant provided the voice-over. See our earlier story about this week’s Radio Times and the interview with Brown, who reveals that Tennant is his favourite Doctor, and that he saw him recently in Shakespeare’s Hamlet. In February, the Sunday Times claimed that writers wove anti-Tory propaganda into Doctor Who scripts in the 1980s. As for the Liberal Democrats, their candidate for Blaenau Gwent, Wales, is one Matt Smith! Doctor Who - less interesting than politics? Competition: win tickets to Utopia!